The Los Angeles Emergency Operations Center - LA-EOC is one of the most extensive city emergency service facilities in the US, providing coordination of police, fire, and other emergency response teams for approximately 3.8 million residents in the event of a natural or manmade disaster. When the city began planning the audio visual presentation system for its new $107 million facility, it turned to SPECTRUM Integrated Technology Consulting Group for the complete AV system design. SPECTRUM ITC Group chose Extron fiber optic and twisted pair products to ensure reliable, high performance signal transmission for the LA-EOC. We specified Extron products for complete end-to-end routing and signal processing throughout the 85,000 square foot facility. John Bilar, VP of Technology for SPECTRUM ITC Group says, "We specified the Extron brand for complete end-to-end routing and signal processing throughout the 85,000 square foot facility." He explains that the systems were designed with Extron fiber optic and twisted pair products, DVI matrix switchers, and audio matrix switchers following testing and evaluation of the products at Spectrum's audio visual systems lab in Oceanside, California. In addition to interoperability testing of specific products, their decision to use Extron was based on their previous experience with product performance and reliability in a wide range of design/build projects and the ongoing product support provided by Extron. At the core of the AV system is a Fiber Matrix 6400 fiber optic 64x64 matrix switcher loaded with seven, hot-swappable 8x8 fiber optic I/O boards and a redundant power supply for added system reliability. Extron DMS 3600 and DMS 1600 DVI matrix switchers as well as modular SMX System MultiMatrix units support routing operations for displays in select spaces, including the breakout rooms. Various source devices transmit analog VGA and YUV signals, which are converted to DVI by Extron RGB-DVI 300 RGB to DVI scalers. Extron DVI 201 and DVI 201 A D twisted pair extenders transmit signals for intermediate distances and FOX 500 fiber optic extenders support long haul transmissions. As a unique requirement, the system allows the different departments to provide others with access to digital images, audio feeds, broadcasts, and data, can cease sharing to specific recipients at the touch of a button. Extron IPL T S2 two serial port Ethernet control processors and customized drivers written by Extron engineers allow the equipment to be controlled through the simple-to-use Extron MediaLink button panel controllers in the breakout rooms. Bilar explains the unique sharing requirement. "We developed this capability based on a previous design for the Department of Defense, which we coined Grant/Revoke. A user with appropriate credentials selects when to share data by pressing the Grant button and stops sharing by pressing Revoke. Extron products and the fiber plant do the rest." 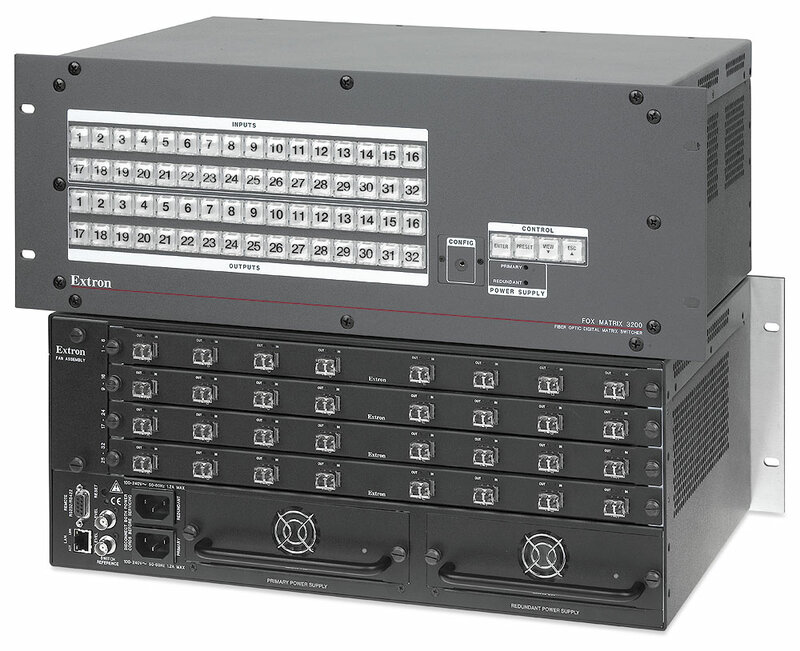 For complex-wide and targeted distribution of audio signals, MAV Plus Audio matrix switchers and a Matrix 12800 provide flexible signal routing. Modular SMX System MultiMatrix 300 frames loaded with 4x4 to 8x8 SMX DVI matrix switcher boards route DVI signals to the breakout rooms. The boards include EDID Minder®, which automatically manages EDID communication between all connected input sources, ensuring that all sources power up properly and reliably output content to the displays. Each breakout room is capable of independent operation as a stand-alone meeting space but with air walls separating rooms 161 from 162 and 164 from 165. With the air walls closed, an Extron MLC 226 IP enhanced MediaLink® controller with Ethernet control operates the sources and an NEC LCD flat panel display in each room. When an air wall is open, a second MLC 226 IP provides source selection and projector control, allowing the two rooms to be bridged for unified AV distribution. Either controller is capable of operating the space's source devices. In addition, a specialized driver written by Extron engineers allows three different devices to be controlled via IR from a single Extron CM-20BB 20-button, four-space control module. The LA-EOC is at the forefront of technology with its AV system built on an all-digital fiber optic backbone that contributes to the distribution of 135 HD channels including over-the-air broadcast feeds, 45 fiber feeds, 25 radio sources, 15 ATSC sources, ten satellite sources, ten cable sources, and a variety of classified camera sources. Up to 45 locales throughout the complex receive and display signals from these diverse sources. The AV system at the LA-EOC is designed to be reliable in this 24/7/365 mission-critical environment and adaptable to changing requirements. Future plans include a new backup system that incorporates Extron multi-graphic display management products and additional fiber optic components. In the meantime, the city of Los Angeles is pleased with its new emergency operations facility, especially the AV system designed with Extron products, which ensures visibility, flexibility, and reliability during extreme emergency situations.